Running out of shelf space? Aunt Mabel left you boxes full? Help is on the way. You can trade them in at Village Lights. Store credit (sorry, no cash) will be issued in trade for your used books. The amount of credit issued will depend on a number of factors: format, condition, subject matter, availability, and salability. Please bear in mind that excessive wear will always reduce the trade-in value of a book. That having been said, a book in "practically new" condition might have very little trade-in value due to the other above-mentioned factors. Trade credit can be used to pay for one-half (1/2) the cost of your USED BOOK purchase, e.g. used book purchase is $12.00; you pay $6.00 in store credit, the other half (1/2) of the used book purchase price being paid in cash/check/charge. This is necessary to maintain cash flow for store operation and survival. Trade credit may not be “cashed out” at any time. Accounts will be closed after two (2) years of inactivity. Trade credit cannot be used to purchase new, rare, collectible, antiquarian, or signed books. Trade credit cannot be used for special orders. Only books in "very good" or better condition will be accepted. Please bring in only books that are in clean, readable condition with covers, pages, and spines intact. Books must not be water-damaged or smell of cigarette smoke or cat pee. Heavy underlining/highlighting or marginalia are undesirable. Mold, spiders, bugs, pet hair, and dirt are simply unacceptable. We will not evaluate books that could pose a hazard to the health of our staff or the quality of our inventory. We do not accept ex-library books (with the exception of some scholarly or rare titles), modern or series romances (e.g. Silhouette or Harlequin), textbooks, Reader’s Digest Condensed Books, encyclopedias, or outdated materials such as software manuals or travel guides. Please put your name, phone number, and email address on each bag or box containing your books. Please understand that we may not be able to use all of the books you bring in. We have limited space and strive to maintain a well-curated selection. We operate under the assumption that you do not wish to retain the books that you bring in for trade credit. Having received the books, we will process them as promptly as time permits, issue credit to your account, and distribute them. We do not hold books pending acceptance of an “offer.” Please understand that we are a “mom-and-pop” business, without a large support staff. We do not process trade-ins “on the spot.” Processing may take days or weeks. Once we have processed the books, we will issue credit to your account and distribute the books. 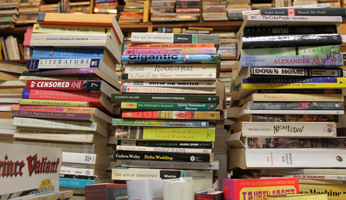 Books that we are unable to use will be donated to charities, prisons, and social service organizations in our region, or disposed of as we deem appropriate. We will not routinely call to notify you that we have processed the books or of the amount of credit extended. If we find an item of exceptional rarity or worth among your submissions, we will notify you to discuss options. We ask that you promptly return our phone call or email. Items that are not retrieved within one month of such notification will become the property of Village Lights Bookstore unless other arrangements have been made.